I AM Speaking to you now! Your very God-Self, reminding you of Me, your innermost, intimate Divine Lover. But most of you have forgotten Me. You have chosen and identified with other Gods above me, of which the most common are your job, s**, entertainments, your virtual life, and last not least your spiritual ego. But in reality your are none of it. How many of you consider themselves to be spiritual, but you are actually not spiritual by continuing further as a separate, self-involved ego, having added a so called „spiritual“ content to your usual life, everywhere promoted: reading nice books, listening to soothing music, smelling incense, using crystals, participating in seminars that teach you to feel better by using enticing materials to please your senses. All these things blow up your ego, glorifying it with some „spiritual“ glitter - although it might help you to relax and feel "holy". But what they do not teach you is your devotion to Me and thereby your Knowing of Me, your own True Eternal Self, free of things and superficial appearances. You are using just another "easy" method not to have to feel the actual situation your are in. Still you are dreaming about a better life in 3D land, which you think would be spiritual, afraid of the tyrants whom you allowed to rule your world, who are taking more and more away your divinely inherited freedom, yoursovereignty and your human rights for self-determination, health and happiness. What is wrong with you! Most of you are either choosing to be "spiritual" by sitting on fairy clouds - as far as possible away from the darkness in your world - which has nothing to do with Me or your own Truth. But you see: your 3D world will not change only by discovering the forces who rule it and fight against them. Your world can change only if you start to discover and understand and use your Divine Creator Powers. Therefore with the recognition of the state of your world you must first of all look for the solution and then forget about the status quo. You must whole-hartedly focus on what you want and not on what you don't want. Otherwise you enforce and magnify the unwanted. Please understand this! 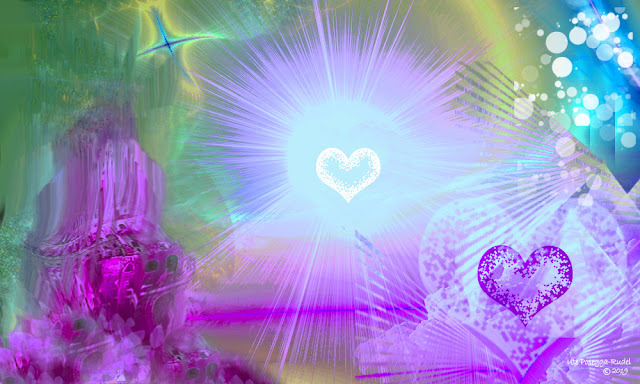 It all begins with the change in your own heart, overcoming duality, Beloveds. It begins with the purification and transformation of the hidden darkness of your own inertia and indifference. You must realize that the world as something you see out there, something other, something separate from you, something objective, is NOT the foundation of your new world, where you are doing just some fixes. The world is no other than you, it mirrors what you carry unconsciously "inside" of you. Therefore you must "fix yourself" first, BEcoming the Divine Being you Are and awaken to your innate Divine Powers, to change the world! And by doing that you necessarily expand your consciousness, you are growing light and greater freedom, unconditional love flowers, where darkness and unconsciousness incarcerated you before. And when you do this, the mirror of your outer world truly changes. Such is your Divine Creative power. So true spiritual life begins with an understanding of that, understanding that it is all about consciousness. YOU ARE CONSCIOUSNESS! And not just your brain-based consciousness which is capable to evolve, but the Ocean of Divine Consciousness, in which all things are arising. To be able to turn around the required 180 degrees, you must start with exploring your own thoughts and emotions and actions, all that which co-created the world exactly as it is now, reflecting back to you your beliefs and convictions. You all are responsible for your world. Because if you did not use all your divine gifts to give to the world and to make it a better place you have not given enough energy to this process. Rather you wasted your energy by following the stream of everybody's life, doing the things, everybody does, wanting to be accepted and to be loved, instead of Being Love. Forgetting your own Divine Uniqueness and Living Power and thereby being vulnerable to the forces of manipulation and mind-control, aiming for a robotic life. Sacrificing your Divine Creative Powers of LoveLight to the ruling forces. This did not allow Me to do My Work and to Emerge within your world. Ask yourself this question: What did you do or what did you fail to do, to be ruled via puppet-politicians who work against your own best interests and who disregard your rights and take your freedom away. The answer is not found within your 3D oriented conceptual mind. The answer is always found within your true Spirituality, within your Divine Heart, within the Knowing that there is Me, your True Ultimate Nature, the Living GOD, all Radiant Consciousness. It IS THE Power to change your world. So what is your own, non-godly, co-creative part in the destruction of your beautiful planet. Please be aware that there is not a single moment where you are not using your creative powers. Unfortunately, you are doing it mostly unconsciously in a repetitive manner, perpetuating the present state of YOUR world, even if you are not aware of it. It is not the creation of somebody else or the creation of a foreign god. What you see and experience, is exactly the world of your own creation, created with Divine Creator Power, because you are created in the "Image of God". So why would you create a dark world instead of a Divine World? Do you truly believe in duality where darkness and light seem to be equal forces? It is a question of frequency only. As much as you allow to vibrate low, light diminishes. When you decide that your frequency is high, you are starting to radiate more and more light. So again, it is a question of consciousness. You Are the Creator of your own frequency and consciousness. There are as many worlds and universes as there are living beings, each one with a different point of view (and thereby frequency). And there don't exist even two identical point of views and therefore worlds. So you must start with yourself first and eliminate in yourself what is supporting the darkness of your world. Each thought follows energy. Observe what you think and where you have always your attention on. And are these divine thoughts and feelings? Do they raise your frequency? Please observe: Are you re-inforcing with your attention what already exists and what you do not want. Or do you put your heart- und love-based focus, bathed in joy, on a „solution of the problem“, on the creation of a new Divine World, with a higher consciousness, based on LoveLight, forgetting what your 3D eyes are used to see. Do you use your innate strength to discover and use your heart-power, that is nurtured by Me, your own very Divine Source-Consciousness, that is the Source of all things that arise? Yes, it is not easy, but what is easy in your world? You did not come here to have an easy time. You came here to transform, to heal, to unite with Me, your True Radiant Heart. It is always hard work. „Easy“ - although promoted by your media - leads you astray and you walk powerless backwards into lower dimensions and thereby frequencies. You are wasting your life-time. Regressing. If you do not progress, you regress, there is no in between. The tyrants of course want you to go easy, because it makes you loosing your Divine creative power, ending up in victim consciousness. They have put into your mind the belief, that if things don't go easy, they are „not meant to be“. In the New Age community it is a commonly worshipped dogma which is being created (!) to weaken you. It makes your spirit low and apathetic. Can you see the cunning seduction? And can you also see Divine Grace in this seduction? Because they challenge you by bringing your tacit agreement with them to your awareness, providing you with the opportunity to make an active choice to truly to awaken and to BEcome who you Are, developing and using your Divine Creative Powers always with high spirit, focus, endurance, and a joy, that defeats all obstacles. If you want to save the world, listen to Me, save first yourself because YOU are the creative source of this psycho-physical realm earth. It is your creation, matter does not exist, there Is Only Light and the energy of It. Therefore, earth is a realm for s/Self-understanding, offering the opportunity to recognize and consciously choose your Divine Powers and Your True Divine Nature That Is Love. To BEcome a Living Radiant Being, to bring Light to this Realm and all others. That Is how you truly change your world! It is no longer 5 minutes, but only 3 seconds before 12! That is how you prevent the death of humanity in a robotic world to happen. Because You Are by My Divine Force Truly Alive in Me. I Am Your God-Self, The One Divine Being and Source of All.